Showing a tremendous never say die attitude, Naas overcome the lose of no fewer than four players in the opening 25 minutes to gain a very important draw at home to Armagh last Saturday afternoon. 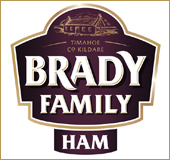 The wretched luck that Naas have experienced with injuries this season has been well documented, but after having had to field without captain Paulie Tolofua, Johne Murphy and Will O’Brien, it was beyond belief that they would see Colm Gorry, Max Whittingham, Andrew Ellis and Richard Fahy forced off in the opening half. Therefore they must be credited with the plaudits for digging in against adversity and gaining a very hard fought draw here. Not surprisingly with so many breaks in play for injuries the first half was a very stop start affair. The visitors with the aid of strong breeze at their backs started brightly and although Cormac Fox missed a penalty opportunity on six minutes for them, he made no mistake when presented with a similar chance after 13 minutes. The ball retention displayed by Armagh was a particulary impressive aspect of their play. At times they were able to go through up to 30 phases, and this meant that Naas struggled to get their hands on the ball and had to defend for long periods. However they gradually worked their way into the game and when the Armagh backs were penalised on 38 minutes for being offside a fine Peter Osborne strike into the wind levelled matters. This made it 3-3 and it appeared this would be the interval score, but straight from the restart Naas made a mistake which led to the concession of a try. After receiving the ball from the kick-off Fionn Carr’ clearance kick was blocked down by Neil Faloon and the latter won the chase to the loose ball to touchdown for the score. Fox was successful with his conversion attempt and Armagh led 10-3 at the break. If the first half failed to set the blood racing the second was totally different and kept the decent crowd richly entertained. The Northern side inceased the lead within five minutes of the restart. This time a clearance kick by Naas failed to reach touch and Armagh sized on their chance. Some slick handling put Chris Cousens in for a score at the corner and although the conversion was missed their lead now stood at 15-3. Two Peter Osborne penalties on 53 and 57 minutes narrowed the gap – the latter won after a superb break and carry by Adam Coyle – but when Fox punished Naas for killing the ball in a ruck after 61 mintues to make it 18-9 it appeared that Armagh would be taking the points home with them. However the Naas forwards rolled up their sleeves and some great work by Coyle, Jordan Duggan and Jack Barry put the Armagh defence under serious pressure. Although they tried to plug the gaps it was to no avail as on 65 minutes Peter Hastie sprinted through to score under the posts. Osbourne’ conversion made it 18-16. Naas though contrived to make life more difficult for themselves on 70 minutes. They had a line-out on their own five yard line but coughed up possession, and before they knew it Armagh had swiftly transferred the ball out to the backs which led to Ryan Purvis scoring in the corner. Fox missed the conversion to make it a two score game, and Naas knew that a converted try would salvage a draw. Four minutes from time they achieved this. Again it was created from some powerful play by the forwards with Jordan Duggan again to the fore. After a series of pick and goes from the base of the ruck, the Armagh defensive line was broken and Conor Doyle was able to dive over a try. Peter Osborne has faced more difficult kicks this season but there was still pressure on his conversion attempt to level the game. However he was up to the task and soon afterwards referee Eddie Hogan O’Connell blew the full time whistle. On reflection after losing four players early in the game this was a good draw for Naas, and the two points gained could be priceless at the end of the season. 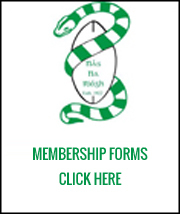 This leaves Naas third in the table just three points behind pacesetters Malone. Next up for them is a visit to St. Marys College on Friday, February 15th with an 8pm kick-off, and all support will be greatly appreciated. 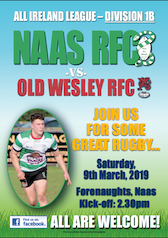 Naas: Peter Osborne, Fionn Higgins, Andrew Ellis, Fionn Carr, Niall Delahunt, Peter Hastie, Max Whittingham, Jack Barry, Conor Doyle, Adam Coyle, Colm Gorry, David Benn, Paul Monahan, Ruadhan McDonnell, Ryan Casey. Replacements:Graham Reynolds, Jordan Duggan, Pierce Dargan, Richard Fahy, Ross Bailey Kearney. Armagh: Ryan Purvis, Evan Crummie, Chris Colvin, Chris Cousens, Shea O’Brien, Cormac Fox, Harry Doyle, Paul Mullan, Andrew Smyth, Philip Fletcher, Peter Starrett, Josh McKinley, James Hanna, Robbie Whitten, Neil Faloon. Replacements:Johnny Morton, Oisin Kiernan, Nigel Simpson, Ollie Millar, Gerard Treanor.